Here are some testimonials of people who have been on our cruises. Some are excerpts from www.tripadvisor.com. Andrew, Captain Fantastic, of the Cook Island Aitutaki Lagoon cruise lives up to his name. Kia Orana Cruise groups are smaller than the other companies, allowing Andrew to be very understanding, attentive and accommodating to every guest. Other cruise companies have crowded boats with loads of tourists. Since Andrew’s boat is smaller, he is able to access many of the Motus that the other boats cannot. Andrew takes you to seven Motus which is over twice as many as the other cruise companies. With each one, Andrew gives you history associated with the Motu and allows ample time to explore. He was safe in maneuvering his boat through the shallow waters to the outer Motus. He obviously knows what he is doing as he had done this many times before. Andrew took us to One Foot Island prior to the hoards of other boaters so that we could get our passport stamped and see what One Foot Island looked like. As we were leaving the great masses of people started arriving on the other boats. One of the best parts of our cruise was our lunch. Andrew took us to a private island and let us swim, play and explore while he prepared lunch, which was served after a short while. One could hardly call it lunch; it was more like a feast for royalty with more food and more variety than I could hope for. The fish he grilled was perfect, and everything else was absolutely delicious. You help yourself to the food served in giant clamshells and there is plenty for seconds or thirds. It was fantastic! After lunch Andrew took us to two separate snorkeling spots with a large variety of fish and giant clams. Andrew picked us up and dropped us off at the dock from our Paul Gauguin cruise in a very timely manner. One additional item – price. You definitely get your money’s worth! For all that we saw and did the price was actually lower than the other local cruises offered. The only things that you need to bring are your swim suit, sun screen and camera. Snorkel gear, towels, and food and water are provided. Everything was absolutely wonderful! Andrew does live up the name “Captain Fantastic”. This was definitely one of the highlights of our trip and I most highly recommend this cruise. From start to finish, Kia Orana Cruises provided a truly memorable, fantastic experience! Captain “Fantastic” (aka. Andrew Katu) picked us up promptly at the scheduled time and took us down to the main wharf and began our full day tour of Aitutaki’s 7 Wonders. With only one other couple on the tour with us that particular day, Andrew provided us with a great, personalized cruise. Our day began with two different stops to snorkel near the motu of Maina. The first spot put us in about 20 ft of water where we were able to see a few giant trevally (3-5 ft long). As well, we saw a number of giant clams! The second snorkel spot was shallow and more protected and we saw beautiful fire coral (yellowish-gold colored thin, slender, fragile-looking coral that resembled a graphic artist’s sketch of flames). After snorkeling, Capt. Fantastic took us to Maina for lunch, where we wandered around and swam, as he prepared lunch. We saw a number of large, beautiful seabirds, too! Lunch was a massive, tasty feast! There was pawpaw, mango, pineapple, coconut, fresh grilled tuna, baked breadfruit, passionfruit, spicy pawpaw curry salad, and a breadfruit salad – a real, authentic, traditional cook islander meal. Lunch was buffet-style and presented artfully: our plates were woven from palm fronds and covered with broad leaves. Each food was presented inside huge giant clam shells! It looked amazing! After lunch we toured a number of the other motu, including Rapota (Survivor filming location), Moturakau (where Andrew led us on a short jungle walk), Motukitiu, Tapuaeta’i (the infamous One Foot Island), and Tekopua. It was at this time that we encountered the first other group of people of the day (a different tour company with about 10 people), so Andrew had us relocate to a secluded spit of sand further out in the lagoon where we had the world to ourselves! Captain Fantastic was friendly, personable, welcoming, informative, safety oriented and a real pleasure to be around! 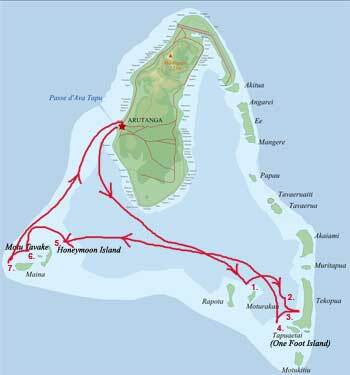 If you are looking for a near-private tour of Aitutaki’s lagoon – Kia Orana Cruises is a must! We researched Trip Advisor before leaving home to choose an operator for an Aitutaki lagoon cruise. We don’t particularly enjoy large groups of people together on trips such as this so we chose Kia Orana cruises as the boat is quick and relatively small. So glad we did. We were with 6 delightful similar thinking travellers and we all agreed we had chosen well. Perfect day on the lagoon. First to the various islands and as the larger boats laboured across the lagoon towards us, we took off for the next island so we were always “alone” in paradise with the islands to ourselves. Captain Fantastic is excellent and a very good boat man. Wonderful lunch (enjoyed that curried Paw Paw salad) and the smorkelling with the giant Trevalley exciting. Great value, great day, could only thoroughly recommend Kia Orana cruises. Ten of us arrived in Aitutaki for a few days stay at Pacific Resort. Five had not holidayed in the Cook Islands before and were very keen to take a lagoon trip to see first hand what the rest of us had talked about. Kiaorana Cruises was suggested to us as we would be together as a group on our own special cruise. Not one of us can speak highly enough of the great day we had with Captain Fantastic Andrew and his son Kishon. The snorkelling, island visits and amazing Cook Island lunch with singing and folk lore tales were above our expectations. A truly wonderful way to cruise the lagoon. We will recommend Kiaorana Cruises to all our friends visiting Aitutaki. Thank you from Marion & Kevan, Lynne & Rex, Marianne & Brian, Liz & Russell, Lynne & Rod. We were recommend by fellow travellers to go with Kia Orana. They were definatley right. This would be the best day trip we have ever done. Small and personal service. Captain Fantasic – you really are. Being a small group met on the islands you could feel like you were the only ones alive, on the lagoon it meant that the beautiful giant clams, fish and coral was all yours to enjoy, without bumping into people. Truely the best way to see this magical place. Lunch was fantastic. Truley brillant value for money. We are hoping to go back next year, but just fly in for the day to this cruise, thats how brillant it was. Please don’t book with anyone else if you want to truely explore the lagoon and all it has to offer. Thank Kia Orana, see you next year.